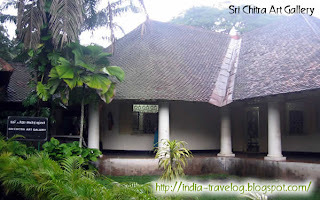 Our main interest in visiting Trivandrum was to see Raja Ravi Varma's famed paintings in the Chitra Art Gallery. Must say - he was an excellent artist. Some of the paintings looked so real - unbelievable. Photography is restricted inside the gallery - so you will have to visit Trivandrum to have a look at the art. But here is a picture of the Art Gallery from outside. 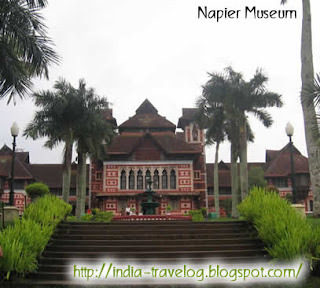 We also visited Napier Musuem in Trivandrum. The architectural masterpiece was designed by Robert Chisholm, the consulting Architect of the Madras Government. The museum houses a rare collection of archaeological and historic artifacts, bronze idols, ancient ornaments, a temple chariot and ivory carvings. 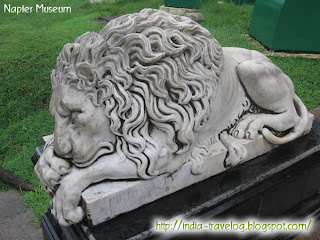 The museums are open from Tuesdays to Sundays from 10 a.m. to 4.45 p.m. On Wednesdays, the museum opens only at 1 p.m.
Also made a visit to the Zoo in Trivandrum. All these three places are located within the same premises - the Museum Grounds. 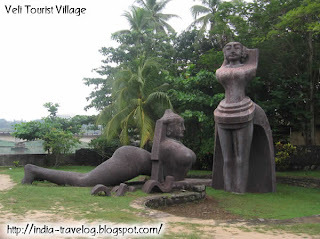 We also visited Veli Tourist Village. 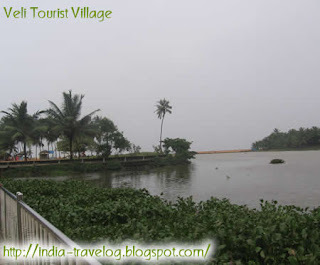 The village has been built at the point where the Veli lagoon meets the Arabian sea. 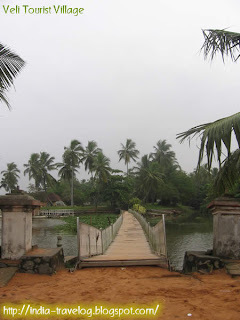 It is replete with fish ponds, wading pools and landscaped gardens, along with facilities for boating and water sports and a park around the floating bridge that connects the village to the beach. The beach was deserted except for a few stray dogs that kept us company. The tourist village is open from : 8:00am to 6:00pm. 2 seater - Rs. 40 for half an hour.